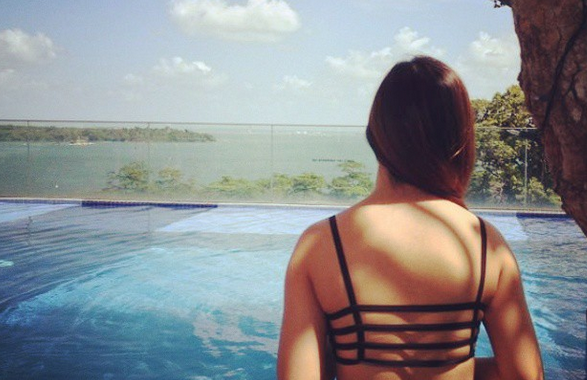 SG Budget Babe: Did Gushcloud Just Spend $26,000 on a Poor Response to the Xiaxue Saga? 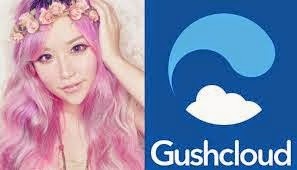 Did Gushcloud Just Spend $26,000 on a Poor Response to the Xiaxue Saga? Have you guys been following the Gushcloud vs. Xiaxue saga which erupted recently this Christmas? I've been keeping myself up-to-date with the whole issue, and you gotta admit, it is extremely entertaining. Whether you like her or not, you got to give credit to Xiaxue, who exemplifies the best and worst side of a Singaporean. 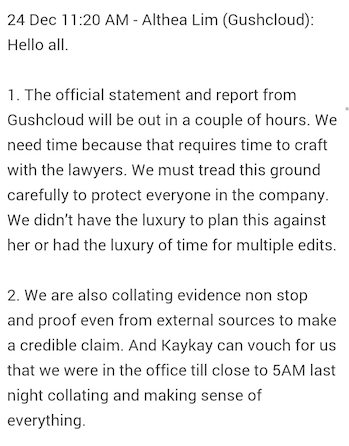 I'm not going to comment on who's wrong or who's right here, but what really appalls me is how much Gushcloud spent on handling the issue and yet did a terrible job at it. "We spent the 36 hours speaking with our investors, clients in the region, influencers and lawyers about this matter". Yet their response was...disappointing, to say the least. And achieved almost nothing to salvage the crisis. 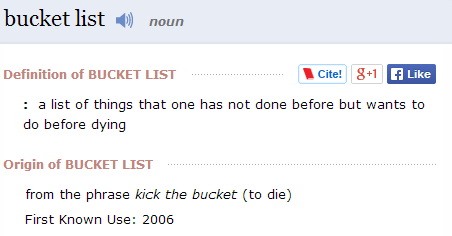 Now this is the one I feel most strongly about. Coming from a PR and marketing background, my favourite module in university was on handling crises. Look, this is a PR crisis more than a legal problem. 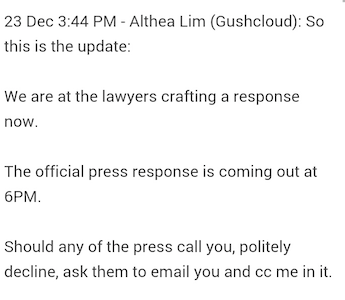 They might have a case for defamation against Xiaxue (I don't know for sure since the last time I touched media law was years ago), but when you are issuing a response to the public and your followers, your lawyers are not the right people for this job. UPDATE 1.39am: Just confirmed my suspicions with this leaked Gushcloud WhatsApp group chat. 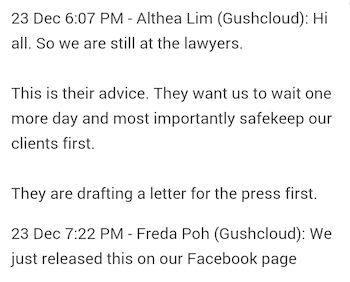 18 hours after Althea's first announcement that they're with the lawyers, it seems their legal team is still at work. Looks like they finally took a break at this point. Next, they decide to get the lawyers in again for another 3 hours. At this point I'm not sure if their lawyers have gone home yet, but if "everyone" refers to investors, stakeholders, influencers and clients (which is likely the case), it is safe to assume their lawyers helped with the email too. Internal email - 1 hour? I consulted a lawyer for legal advice earlier this year when I sued my employer in court just to get back $2000 (they owed me salary and refused to pay up after I resigned). As I represented myself in court (and won), my only costs were the few sessions I spent in legal consult. 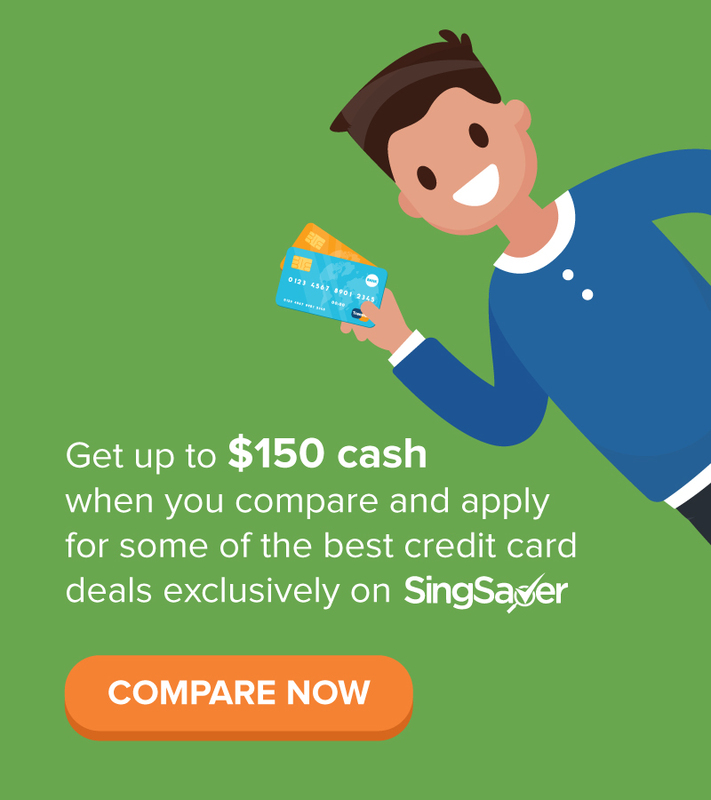 It was a top-notch lawyer, reputed for being one of Singapore's best, and who happens to also be my mum's friend, so she asked for a discounted rate for me. Still, the total amount was still heartbreaking! 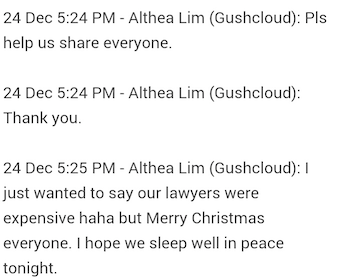 And to think that Gushcloud spent perhaps 33 hours with their lawyers (almost 16 times of mine! ), you can only imagine how much they paid. A decent lawyer charges at least $400 per hour. 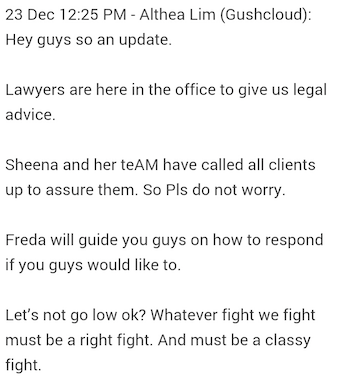 Althea mentioned "lawyers" in plural, so let's assume it refers to a minimum of 2 lawyers. My guess is that Gushcloud probably spent over $26,000 ($??) during this crisis, although this is purely a rough estimate on my part. What they should have done was to engage a PR consultant to manage the crisis and draft Vincent Ha's response / the press statement / the stakeholders' email instead, followed by their lawyers spending 1 - 2 hours (max) to vet through before release. 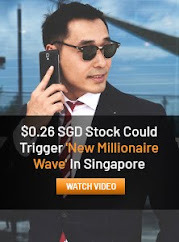 I can't really comment on PR rates as it has been a good 2 years since I was last with a PR agency, but from a quick salary search online, I found the average wage of a PR person as $38 per hour in Singapore. A good PR consultant can charge as much as 3 - 5 times of their cost rate. Which means Gushcloud could have spent between $1,250 to $6000+ instead if they had gotten good PR folks to handle the crisis. Just look at the savings! And after all that money, Vincent Ha's crafted-by-lawyers official response still hasn't addressed or resolved the crisis, he merely glossed over it. Their first public response was so poorly written, it sounds exactly like what my ex-boss said when I took him to court earlier this year. "Ms. Cheng's allegations are inaccurate" - Why? On what basis do you claim this? "We think that the Blog Post was calculated to disparage and injure our reputation" - Yeah, like we were simply mindless naive folks who couldn't tell Xiaxue was obviously attacking you guys from her post. Plus, who cares about what you think? And you couldn't even tell us WHY you have reason to think this is so? 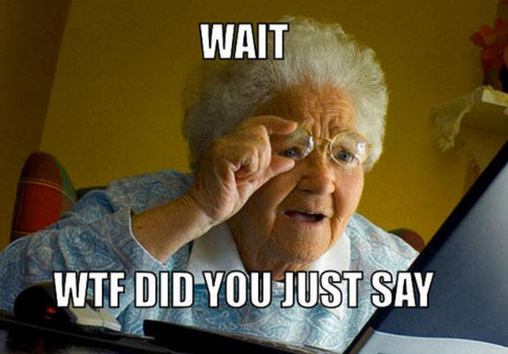 "The timing of the release of the Blog Post also speaks for itself" - What are you trying to imply it suggested? "Reserve all our rights against Ms. Cheng" - In other words, no comment. Which every good PR or media student can tell you is always the worst thing to say in times of crisis. 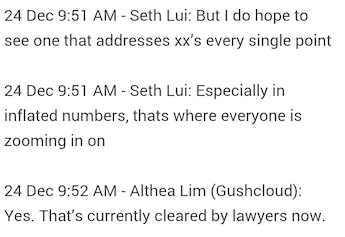 Xiaxue accused Gushcloud of several offences, but when I read Gushcloud's responses (one from CEO Vincent Ha, and another from co-founder Althea Lim) they only answered the part on inflating their earnings. Vincent Ha admitted that the Straits Times article in 2012 was wrong and he should have corrected it then, but it was an oversight on his part. Seriously? 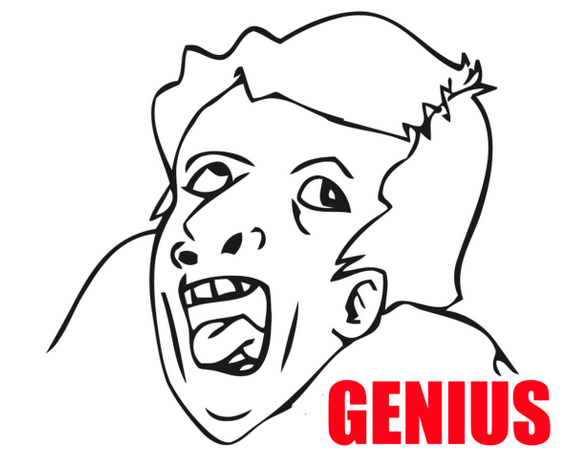 You had 2 years to correct a mistake and you didn't do so until Xiaxue literally "forced" your hand? 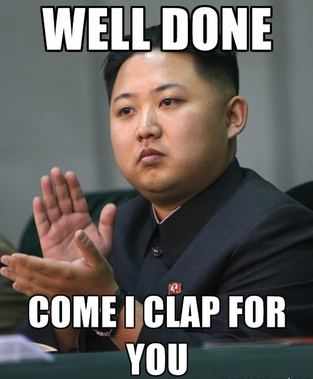 Other than that, he didn't directly answer any of the other questions that Xiaxue raised among us readers. This only makes me suspect they may have something to hide...do they? Look, it is only human nature to make mistakes, and we can all relate, but not having the guts to address the problem directly only suggests that you're not being completely honest. 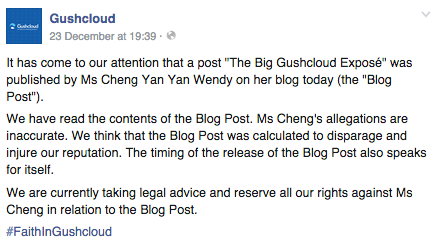 "So I, ALTHEA LIM, IN MY PERSONAL CAPACITY, SAY TO YOU, WENDY CHENG, THAT YOUR ALLEGATIONS AGAINST GUSHCLOUD IN YOUR BLOG POST ARE FALSE. I, ALTHEA LIM, IN MY PERSONAL CAPACITY, CALL YOU A LIAR. If you truly believe that you are not lying in your blog post on Gushcloud, I invite you to sue me FOR CALLING YOU A LIAR. And if you do not sue me, then I guess that speaks for itself." Wow. I think I was 12 when I stopped writing like this. 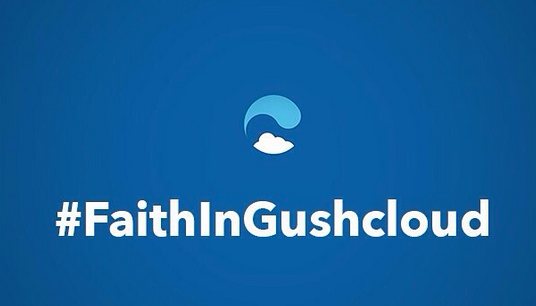 With this being a social media battle, it was a smart move by Miss Freda Poh to come up with a hashtag to garner support for Gushcloud by asking their influencers to post #faithingushcloud, leading to a chain effect of people on their side reposting the hashtag. 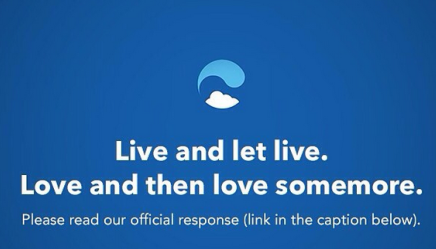 But really, she ought to have hired a copywriter instead for the job! Perhaps she thought it was smart to use the word "faith", since it is Christmas and all. 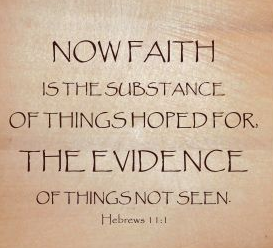 Faith - the evidence of things not seen. Xiaxue presented what seemed like evidence to make a convincing argument, but Gushcloud responded with a hashtag that otherwise suggests a "I have faith in you even though you have no evidence to show me you're innocent". 16 hours later and she's still propagating her mistake. Even funnier was how Gushcloud had to create their own hashtag, while #faithinxiaxue was created by the public without Xiaxue doing anything. My dear Freda, you should have used #ibelieveingushcloud instead. At least that comes with 1) a personal stamp of trust by whoever posts it and 2) the meaning of believe is much more appropriate in this case. "You can imagine how the feeling of escape the near-death of a company and to see your efforts start to pay off. 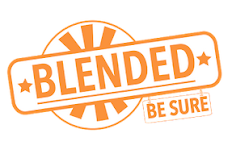 I was personally in the US making arrangements to shut our business operations down around the relevant point in time and to look at turning it into a product development office. " Ideal public reaction - Oh no! So poor thing, they are a struggling business just trying to survive, let's not be so hard on them lah. Emotional appeal was popularized by Thomas Paine, whose words propelled the colonies into the Revolutionary War in 1776. Appealing to emotions can be a good tactic to persuade if used effectively, but unfortunately for Gushcloud, Budget Babe has been trained to identify these sort of things, so I'm not impressed. Xiaxue used logical appeal to persuade her readers when she wrote about the big Gushcloud expose, by relying on statistics and data to make her case. Whoever read her post will naturally expect a logical response from Gushcloud, addressing each and every one of her accusations head-on. Did they do that? No. IN SUMMARY, Gushcloud may have spent over $26,000 on lawyers' fees alone (and this is only guess estimation on my part) when they could have paid just a fraction if they had engaged PR folks for the solution instead. The result? A total of 2,977 words (according to my Microsoft Word count) on Vincent Ha's official statement emphasizing on the things they've done well since they started. We DON'T CARE. If a crisis happens, we want you to admit what you've done wrong, apologize, and tell us what you will do to make things right. NOT tell us how good you are or try to make us feel bad about wanting answers. 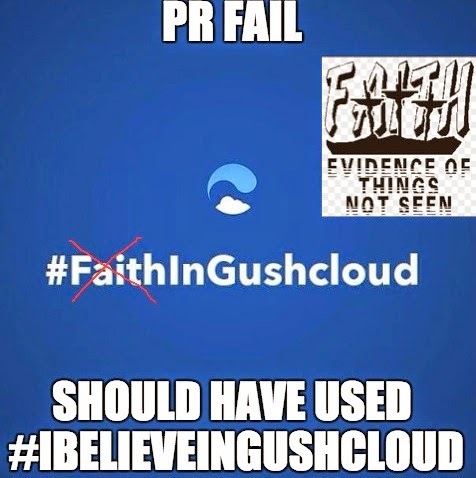 I don't have anything against Gushcloud, but don't you agree that the way they handled the crisis was appalling? 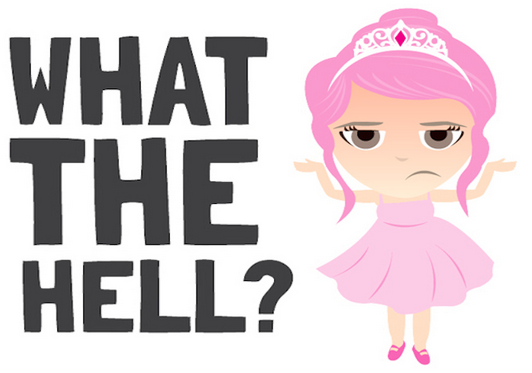 This apt meme taken from Xiaxue's blog. 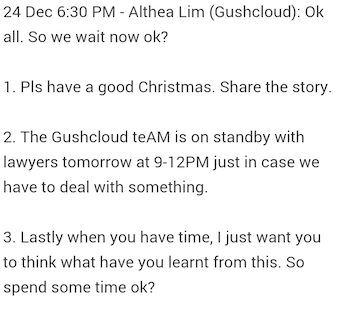 Aiya, Gushcloud should have just spent that $26k to hire me lah. At least I could have drafted a better response for them. Not sure if Gushcloud will ever properly recover from this, but at any rate, this is one case to learn from on how NOT to handle a PR crisis. Budget Babe works as a freelance PR and marketing consultant on weekends (that's partly how she saved $20,000 in a year), although most of her clients are small-businesses and start-ups. All the figures and analysis in this post are merely guesswork on her part and are not meant to reflect the actual amount Gushcloud truly spent (which she would love to know!). Hey i just came across this post and thought it was extremely well written. Sharp and to the point. Keep it up! Wonder which lawyers they used though lol.